If you are having problems maintaining a healthy appetite, fermented wheat germ extract sounds like something you’d want to avoid. You can probably imagine reading through the ingredients on food you purchased and wondering, “What the heck is that? Why do they have to add so much garbage to food? !” You might think it was a preservative or added for flavor. But it’s neither of those things. It is, thankfully, exactly what the name describes. It is derived from the germ (another word for “seed” in this case) of wheat. An extract is taken from the ‘wheat germ’ and is then fermented. This all-natural substance has been put through more than 100 studies, including human trials and the results have been impressive. So what can it do for you? It primarily helps boost your immune system, helping your immune system tell the difference between “good cells” and “bad cells” and helping it repair the good ones. In the same respect, it helps your immune system identify the bad ones so it can get rid of them. One specific way it helps your immune system is by regulating cell metabolism, specifically glucose metabolism at the cellular level. What does that mean for you? Plain and simply, “enemy cells” – the bad guys – won’t get the fuel they need and will starve. Another thing it helps your immune system with is coordination. Your immune system is a complex place. It has several different types of cells that all need to work together for it to perform correctly: macrophages, T-cells, B-cells, and NK-cells (all forms of white blood cells). But when your immune system is working hard against enemy cells, these different white blood cell types may start to lose their efficiency. They may stop working together effectively, reducing the effectiveness of your immune system as a whole. 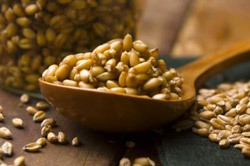 Fermented wheat germ extract promotes the coordination of all of the cell types so they can respond together as a unit. Each white blood cell type can then do it’s job at the right time when up against enemy cells. But it doesn’t only help the coordination of the cells. It also helps the effectiveness of each type of cell. It enhances B-cells so they can produce the antibodies they produce in a timely fashion. And it also helps T-cells respond to threats effectively. Finally, it helps NK (Natural Killer) cells target the enemy cells. To sum it up, fermented wheat germ extract helps the cells of your immune system work at their peak levels when they’re under stress. And it also helps them work together. That helps your immune system perform at it’s peak level. And when your immune system is performing well, you will maintain a healthy appetite and your body will be able to get the nutrients it needs from food on a continuous basis. Fermented wheat germ extract is the main ingredient in AvéULTRA, also all natural. And you now know how it can boost your immune system and help you maintain a healthy appetite. So give it a try today.